I love parties. I love to go to them. I love to eat at them. I love to throw them. But, sometimes you’re worrying too much about all the little details, like whether the pink in the table linen matches the pink in the decoration banner that you just can’t sit down and relax. Sometimes you just wish you could have someone come in and cast a magic wand to fix it all so you can party like its 1999. That’s why having a helping hand isn’t always such a bad thing. In fact, it can be a very good thing. That’s why hiring a party or event planner can be a great idea. A new company called Big n Little Productions can pretty much do anything from not letting you sweat the small stuff to planning the whole event for you. The best part is since they are brand spanking new, they are currently working for testimonials and photos. That means they are working for free for events in 2014! So, kick back, relax and let Big n Little do the work! And What’s Your Name Little Girl? Your name. It’s something you hear right from the moment you are born. You learn to answer to it. You learn to say it. You learn to write it. You learn to either love it or hate it. Apparently, if you’re my daughter, you also learn you can change it! Yeah, that’s right. I think my daughter is driving a one person petition to change her name. I don’t know why because I think she has a beautiful name. If we named her something ugly or stupid then maybe I could see her reasoning. So, She goes around telling people her name is “Mina” (Mean-a). Her name doesn’t start with an “M” nor does it rhyme or sound anything like “Mina”. Still, she is “Mina”. She does it in the house. She does it in front of family. And now she’s starting to do it in public. This, folks, was my worst fear come true. At her cousin’s birthday party over the weekend, one of the worker’s at the little play gym went around the circle asking the kids their names. Since she can’t say her real name yet, I expected my husband to answer for her. But, before he could open his mouth she blurted out “I’m Mina.” I laughed. What else could I do? She knows her name is not Mina because I correct 100 times a day. Still, she’s Mina. Even when I yell at her she says, “No, I’m Mina.” So, then I yell at Mina too! It’s all silly now, but I’m really afraid she’s going to call herself Mina when she goes to pre-school in the fall. The teacher is going to look on her list and realize she doesn’t have a Mina! She’ll make friends and they’ll call her Mina. She’s going to have split personalities. Ahh!!! Everyone asks me where she got the name from. There is a show she watches and the lady’s name is “Nina”. So, I’m thinking she’s getting it from there. That is truly the only thing I can think of. I need to call Nina and tell her to change her name! So what’s a mom to do in the “Mina time”? I guess I’ll keep correcting her and hope this is just one of those annoying phases! So, I was just surfing the internet this morning and came across this annoying story. Apparently a mom in Texas was told she couldn’t breastfeed inside a Victoria’s Secret store. The mom asked if she could use an empty dressing room, but was told no. If that wasn’t bad enough, she was told to go outside the store to do it! So, she chose to go into a public restroom (yuck!). If she was bottle feeding no one would tell her she couldn’t give her crying baby a bottle inside the store. Victoria’s Secret has apologized and will apparently give the woman a $150 gift card for her troubles. It’s just a shame that things like this are still happening so often. Women should be able to do something as natural as breastfeed their baby whenever they need to without feeling like they are doing something wrong. As a stay-at-home mom you obviously spend a lot of time with your kids. A lot. So, when you get to spend a night out without them, it’s a big deal. A very big deal. Sometimes, it’s even better than getting a full eight hours of sleep. In my opinion, it’s actually more important. I’m not a doctor of any kind, so my advice simply comes from what the crazy people in my head tell me. There’s my disclaimer. I came to this big revelation after a recent night out with a longtime friend. Both of us have two children around the same ages. We have frequent play dates and pretty much keep the same social calendar full of story times and arts and crafts. Sure we see a lot of one another with plenty of time spent talking over glue sticks and construction paper. We’re both so busy and committed to our children that we often forget to take a little time out to remember who we were before we were “so and so’s” mother. I’m sure many of you out there can relate. We were all someone equally as fabulous before we took our mom crowns. Sometimes we need a night out to remind us. While sleep refreshes you, it seems to be only temporary. You’re bound to get tired and cranky all over again. Just rinse and repeat. Whereas with a night out, you get a whole lot more bang for your buck. During a night out with a gal pal, you can just relax and have a conversation without being interrupted one hundred times a minute. You can talk freely and not have to spell out all the bad words. You can say “f***” if you want to and use it as an adjective, verb, or noun and not have to worry about having a potty mouth. You can talk about your dreams and not feel guilty if they don’t include endless days at the park. You can talk trash about someone and not have to worry that big ears will tattle tale. You can let your guard down and it’s okay. A night out doesn’t make you a bad mom, that is unless you’re doing bad things! Although we may feel guilty at times (myself included), I think it makes us better mothers. Why? Because we have time to ourselves and can be reminded that we are more than just mothers. We can also use the time to recharge our batteries so that when we see our kids again we are less tense and can be more like the carefree mothers we all wish we could be more often. We can enjoy our families more. Whether you stay at home or work, being a mother is a laundry basket full of responsibilities that lasts a lifetime. It is stressful and wonderful all at the same time. It makes you laugh and cry. It makes you scream like your hair is on fire and then makes you feel bad ten minutes later. It is messy and wonderful and full of drama we never expected. It is full of love, smiles, and more hugs and kisses than we could have ever imagined. So, if you’re lucky enough to get a night away, take it!!! You and your family will be better for it. As a Mom, I’m always worried about my kids, especially when they are not with me. My oldest daughter will be spending more time away in the fall as she heads to Kindergarten . So, when I heard a bullying story involving 5-year-olds this morning, my ears immediately perked up. Apparently, the “mean girls” phenomenon is hitting girls younger and younger. Check out this clip from “Good Morning America” if you missed it today. It’s so sad that things are like this these days. Do you worry about bullying in school? Anyone who knows me can vouch for the fact that I am an avid coffee drinker. Some may even go so far as to say I’m a little addicted. I’ll just say I like it…a lot. 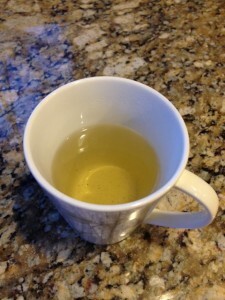 So, when I was approached to try some new tea, I was a little skeptical. How good could a cup of tea actually taste? Since my new mantra for 2014 is to try new things, I thought why not. 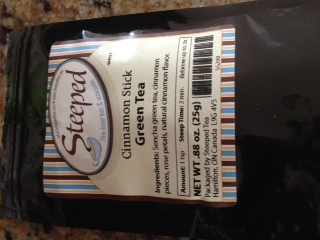 Plus, the woman who asked me sells the Steeped Tea, Inc. products with her young daughter. I thought it is just great that she is teaching her daughter the skills of business through something they both enjoy…tea. I just couldn’t say no! On the rare occasion I do have a cup of tea, it is usually from your standard tea bag you can pick up at any grocery store. So, this was my first time actually seeping tea. 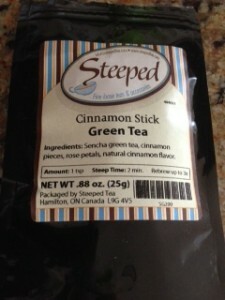 I chose to test out the Cinnamon Stick Green Tea as my afternoon pick me up, in place of another cup of coffee. 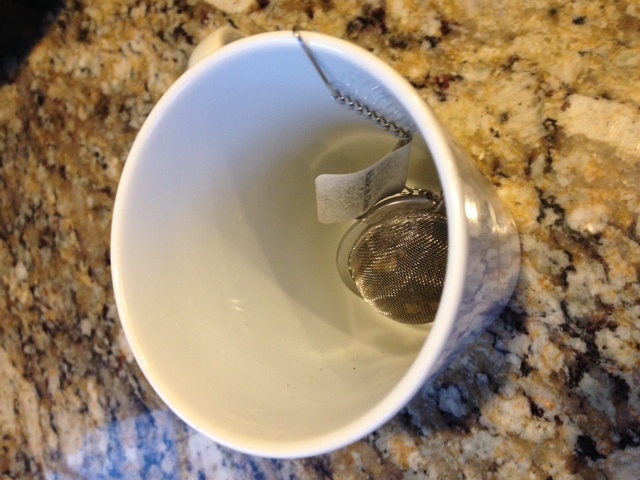 The tea comes in an easy to open resealable pouch. You just measure one teaspoon and put it in mesh ball infuser. It was not only easy to fill, but also had a little hook to attach to the side of my cup so I didn’t have to go fishing inside a hot mug to yank it out. Once I seeped it for the recommended two minutes, I simply unhooked the latch and was able to enjoy my cup of green tea. 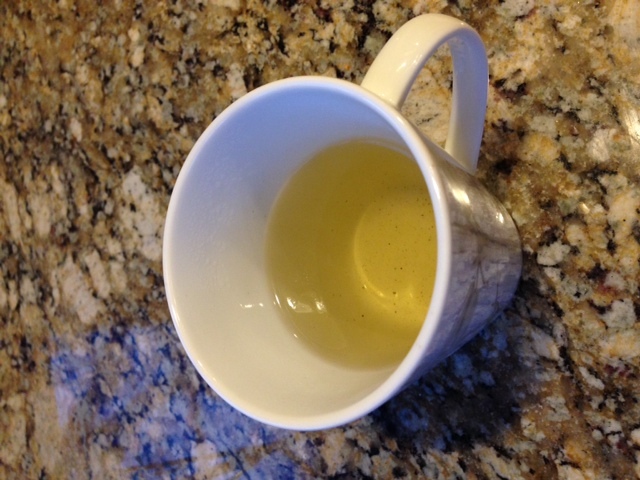 The tea had a nice scent, not too overpowering, yet enough to know there was a hint of cinnamon. The taste was not only light, but also still gave me just the right boost of energy I needed to get through the rest of my day. I’ve had plenty of other green teas before and some of the tastes are so strong they make you want to spit them out right away. That was certainly not the case with this Steeped Tea. I enjoyed my first cup so much I rebrewed the infuser again (it says up to three rebrews on the package). Once I again, I was pleasantly surprised with the outcome. 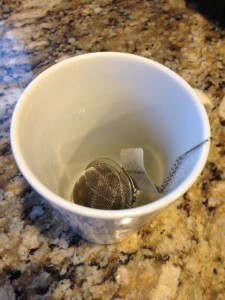 I’ve never tried to rebrew a regular tea bag, but my guess is, it probably wouldn’t taste so good! How Do You Get Your Kids in Bed by 7? Yep, its nine o’clock at night right now and both of my kids are still awake. I’m sure many of the so-called sleep experts and many other parents would put me in their books of shame. But, I’m not ashamed to admit that this is pretty typical in my house. My kids are not in bed by 7. Never have been and probably never will be. I’m also not ashamed to admit that I am jealous of the parents out there who can get their kids to close their eyes at 7 at night and not open them until 7 in the morning. Are some of you lying about your kids sleeping habits? I would love to put a nanny cam in your house to see if you are telling the truth! I don’t want you to think I haven’t tried a more regimented bedtime routine. We do the whole story thing, tuck in, and night night, just like all the books and magazines tell you to do. Then we get untucked, read an encyclopedia and stay awake for hours. I just can’t seem to successfully force a bedtime on my kids. It’s not like my kids are up till midnight, but they are more in the nine to nine thirty range. Now, there’s a study that actually shows that the time parents choose for their kids may not jive with his or her internal body clock. This study is worth reading because it makes me feel like maybe my kids are not as crazy as I may have thought and maybe I’m not either. Maybe. My kids do have a routine, but they just seem to fall asleep when they’re little body says enough is enough. Unfortunately, it’s not always when I’m ready to stare at the back of my eyelids for the next seven hours (that is seven, if I’m lucky….more like six). There have been plenty of nights when I try to get them in bed earlier, but it just doesn’t work. That is, unless I want temper tantrums and fights that make me angrier than when they took ALF off the air in the eighties. With all that said, if you are one of those parents who HONESTLY get your kid to be early, enjoy it. Just know that I’m awake with jealously and already thinking of all the coffee I’m going to have to drink tomorrow to keep up with these energizer bunnies. I’ll admit, I love to sleep. I mean, really, who doesn’t? But, with kids running around and calling your name 24/7, sleep takes a back seat when you’re a mom. If you’re like me, not getting enough sleepy gives you a serious case of the cranks. Now, there’s a study that may explain why. Apparently, women need more sleep than men. Check it out: http://www.news.com.au/lifestyle/health/duke-university-scientists-find-women-need-more-sleep-than-men/story-fneuz9ev-1226596253113!